A group of wonderful women here in Portland have put together a project to make quilts for survivors of the recent earthquake and tsunami in Japan. They have recruited quite a few participants and they are sewing up a storm. I learned about the project from dear friend Alicia Paulson’s Posie Gets Cozy blog. What’s a quilter to do, I ask? Make a quilt to contribute to the project, of course. 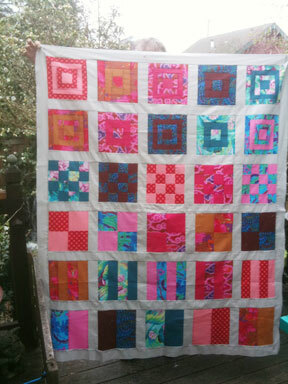 So I whipped one out in a hurry, using Elizabeth Hartman’s Mod Sampler Quilt pattern and some of my most favorite Kaffe Fassett bright colorful prints that I’ve been saving up for something special. 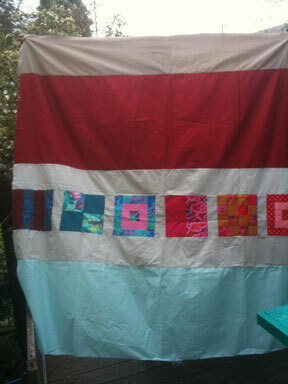 The back of the quilt, just as the wind was picking up. Tonight I delivered it to Cool Cottons, where a sewathon for Quilts for Quake Survivors was going on. There will be further work sessions where someone will quilt it on a long arm quilting machine, before it gets sent on its way. I wish I could watch it on its journey to comfort someone in Japan. What better use could there be for a quilt? If you are a quilter or can sew, I hope you join in this worthy project, there are many ways you can help.